Mrs. Sarah Tarleton Colvin, of St. Paul, Minn., was a member of the well known Tarleton family of Alabama. 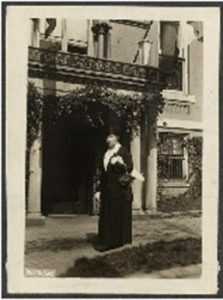 Her husband, Dr. A. R. Colvin, was a major in the Army, and acting surgical chief at Fort McHenry during World War I. She was a graduate nurse of the Johns Hopkins training school, and worked as a Red Cross nurse in the United States during the war. She was the Minnesota state chairman of the NWP, and a member of the “Prison Special” nationwide tour of speakers in Feb-Mar 1919. She was arrested in watchfire demonstrations Jan. 1919 and sentenced to two terms of five days each. Source: Doris Stevens, Jailed for Freedom (New York: Boni and Liveright, 1920), 357.